Over the past decade, ancillary revenue at the 10 airlines that collect the most in fees jumped from $2.1 billion to more than $28 billion by 2016, according to IdeaWorks Co. The top three U.S. carriers accounted for $16.3 billion of that amount. Bag fees “have proven to be big revenue generators, and they too will become status quo in the trans-Atlantic by end of 2019, and globally thereafter,” Jay Sorensen, president of IdeaWorks . . .
What Does Your Airfare Actually Buy? Revenue from fees and other payments is “growing every year because it works,” said Jay Sorensen, the president of IdeaWorksCompany, a consulting firm that focuses on the airline industry. According to a report his company released this fall, the airlines made more than $82 billion in ancillary revenue — fees from passengers and other payments from partners like credit card companies and hotels — in 2017. That is about $46 billion more than five years ago. The report, sponsored by CarTrawler, a company that provides car rental recommendations on many airlines’ websites, used data released by 66 airlines last year to extrapolate the likely ancillary revenue of 184 carriers worldwide. Global airlines are expected to earn a record $82 billion US this year by charging customers extra for everything from seat assignment to baggage fees to travel commissions. And Air Canada is among the top ten airlines in the world when it comes to earning this so-called ancillary revenue, racking up nearly $1.18 billion US last year, according to reports from IdeaWorksCompany, a U.S. research company that tracks airline revenue. 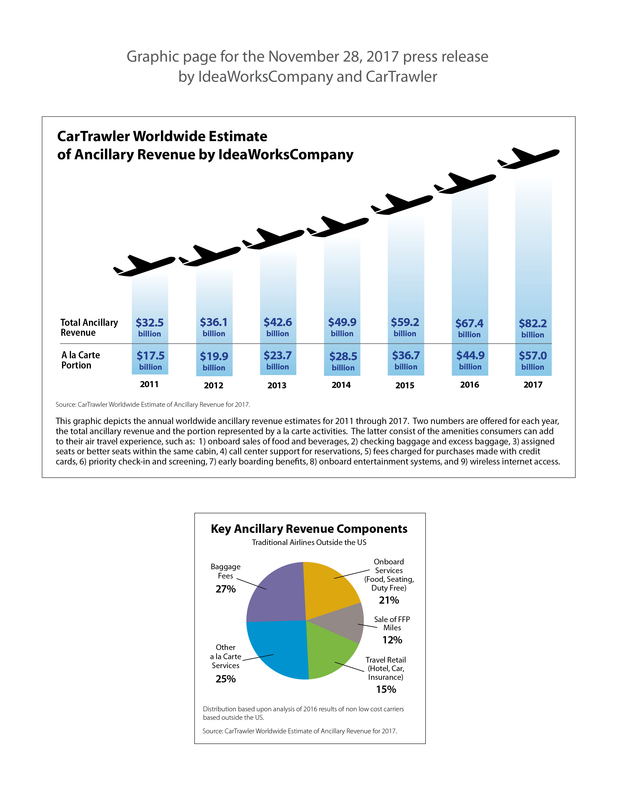 The CarTrawler Worldwide Estimate of Ancillary Revenue report from IdeaWorks Company, a consultancy on airline ancillary revenues, and CarTrawler, a provider of online car rental distribution systems, included income earned from a broad range of sources such as hotel booking commissions, the sale of frequent flyer miles to partners, and the provision of a la carte services like checked baggage, premium seating, and priority boarding. New report explores how airlines are creating profitable products and services, including examples from Allegiant, Delta, easyJet, Gol, Jeju Air, and Tui Netherlands. Airlines have always focused on the number of seats they sell. It’s similar to auto manufacturers’ fascination with selling cars, rather than focusing on the business of transporting people. Likewise, carriers shouldn’t focus solely on airline seats, but rather on the entire time a consumer spends away from home. Instead of claiming a small piece of this business, airlines could broaden their agendas to become complete retailers of travel. IdeaWorksCompany and analyzes what guests earn back from hotel bookings. The study sifted through 1,350 reward queries from six reward programs: Best Western Rewards, Hilton Honors, IHG Rewards Club, Marriott Rewards, Starwood SPG and Wyndham Rewards. As part of the process, the lowest reward price in points was recorded alongside the corresponding room price in U.S. dollars.